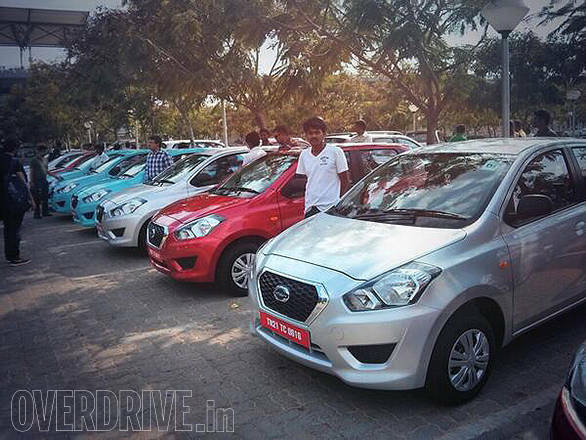 A year after its official unveiling, the Datsun is finally here and we have driven it in Hyderabad. The car will go on sale in a few weeks from now and Datsun has already shown the car to its prospective customers by way of feedback seminars, showroom previews and, more recently, by displaying it at the 2014 Auto Expo. But for those of you who haven't managed to see the car yet, let us run you through the details of the Datsun GO's design. One glance at the car and you will know that the GO is a fairly large hatchback. Based on the same V-platform as the Micra, the GO is longer, yet marginally narrower than its Nissan sibling. The styling is contemporary. Hexagonal grilles are the flavor of the season, but the Datsun grille has enough flair to stand out in the crowd. The chrome garnish isn't too flashy and gels very well with the honeycomb type mesh design of the grille. The angular styling cues are seen in the headlamps and the air-dams as well. The side profile has four prominent creases. The shoulder line originates from the headlamps. A buttress flows over the rear door handle and cuts into the taillights. A crease runs from the front wheel arch into the tailgate. A crease at the lower part of the bodywork runs along the length of the doors and disappears into the rear wheel arch. While all these can make you perceive the design to be busy, it is not. The creases are subtle and are noticeable only when observed closely. The colour of choice also has a big part to play in this regard as the creases tend to disappear on a lighter shade. The 13-inch wheels with the 155/70 section tyres look a tad tiny for the Datsun GO. The tailgate looks smart and the buttresses we spoke of, look better from the hindquarter. The loading lip for the boot-lid is high and therefore, easily accessible. The taillights are squarish and the wrap around effect looks good. The Datsun GO continues to impress with its remarkable interiors. The quality of plastics and the fit and finish is impressive for this segment, but it is the quirky design that sets it apart. The most noticeable element is the front bench. It is made up of two bucket-seats with slim backrests and integrated headrests, but the passenger seat has additional cushioning between itself and the passenger seat. With only two seats belts provided, Nissan insists that this extension is strictly for knickknacks and not for a third passenger  but needless to say, its bound to be both. 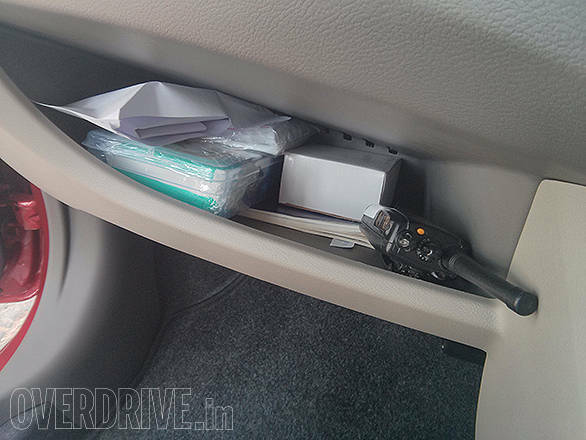 Another aspect that will grab your attention is the umbrella-type handbrake mounted on the centre console. The centre console gets mobile holder as well. It's similar in design and quality to the aftermarket mounts that are available abundantly. The Datsun GO gets power windows for the front doors, however, every door gets its individual control and the driver has no control on the other windows. The outside rear-view mirrors are old-school and needs manual adjustment  no levers or switches here! The foot-well is well spaced out and clutch operation is decent. Powering the Datsun GO is the same 1.2-litre, 3-cylinder KB12 petrol engine from the Nissan family. The state of tune however is different. Tuned for better fuel efficiency, the Datsun GO's engine produces 68PS of power and 104 Nm of torque and claims a fuel economy of 20.63 kmpl  which is exactly similar to the Hyundai i10's claim. The GO claims to sprint from 0-100 km/h 13.3 seconds  which is quite quick for a car with entry-level specifications. At the same time, the engine is also quite torquey for a petrol engine and makes for a good mid-range grunt, which not only aids in urban commuting, but also contributes towards better fuel economy. The cabin is well insulated and the typical burble of a 3-cylinder motor isn't evident to the occupants. The vibrations are quite low as well. 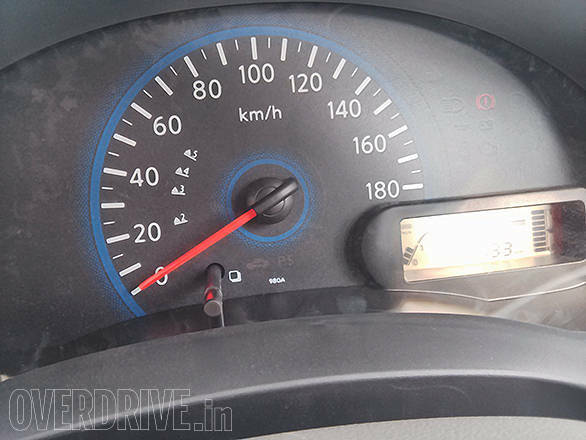 The Datsun GO features a speed-sensitive electronic power steering system, which is well weighed. It isn't as light as a Hyundai, but is convenient for both  city as well as highway duties. The gearbox has precise throws but feels a tad notchy. 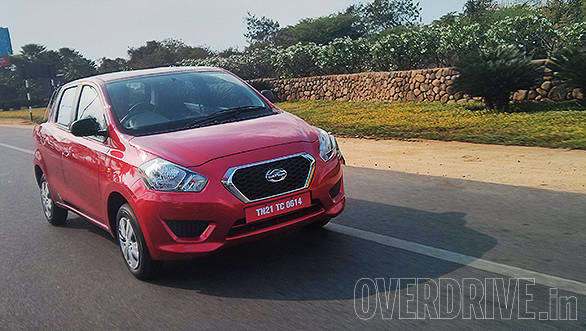 The downside for the Datsun GO is lack of enough safety features. 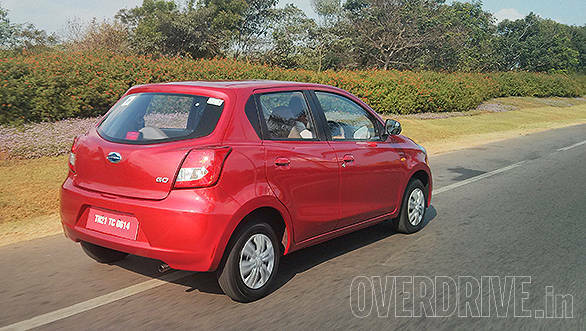 Unlike the Alto 800, the GO doesn't get airbags on any of its variants. While it runs disc brakes up front, it doesn't get anti-lock brakes. Wheel lock-ups are therefore, evident under hard braking. The car tends to change direction slightly in such circumstances, but during our test, the GO did not feel violent under hard braking. 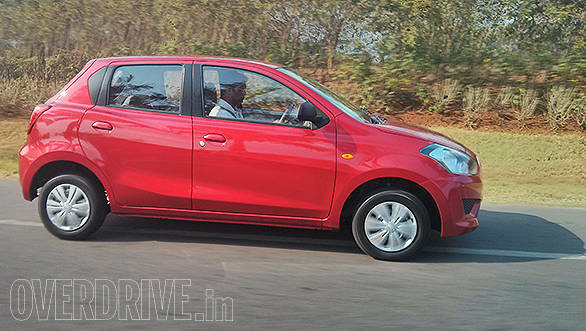 Ride quality is quite good and the Datsun GO feels stable even at highway speeds. On undulated roads, however, the suspension feels a tad bouncy. 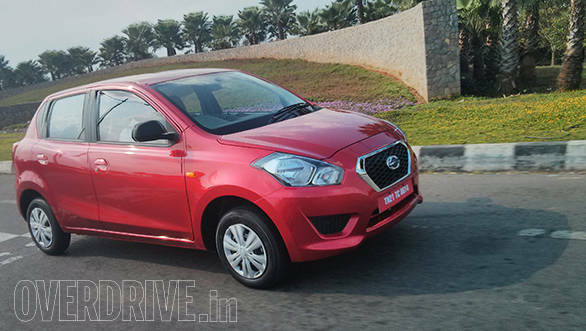 Overall, the Datsun GO comes across as a well put-together entry-level offering. Its trump card is the space that it offers and price tag that is expected to start well under Rs 4-lakh. It does come at the cost of some safety features and creature comforts though. But that said, the Datsun GO ticks all the right boxes for what the Indian consumer is looking for in an entry-level hatchback. For details on fuel efficiency, click here. For full feature and specifications list, click here.